"Trust me, we have never faced anything like this. It's a real work of art." As the Galactic Empire spreads itself across the galaxy, even the most independent beings are drawn into the growing power struggle. Soon, the ranks of both the Empire and the Rebellion will be bolstered by two warriors who aren’t afraid to think for themselves. 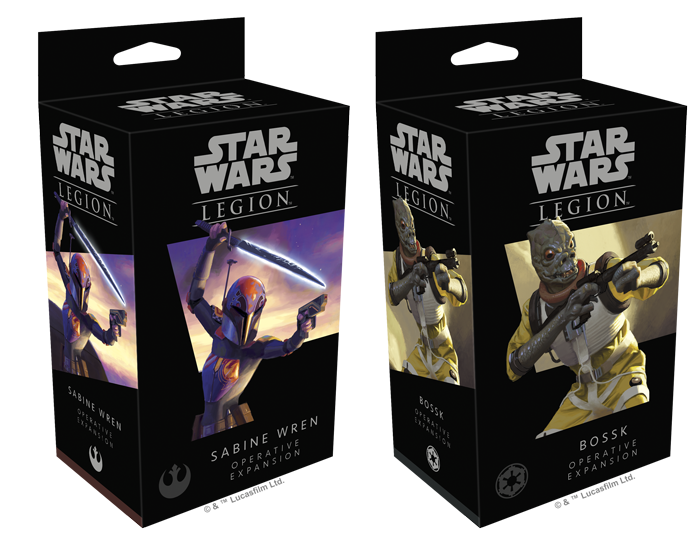 Fantasy Flight Games is happy to announce two new units for Star Wars™: Legion! Whether fighting for family honor or in pursuit of their next big score, both Sabine and Bossk bring all their skills as bounty hunters to your armies, bringing with them creative solutions to common problems found on the battlefields of the Galactic Civil War. Featuring new command cards for each of these operatives as well as a variety of new upgrade cards to customize your armies, these Operative Expansionsunlock deadly new options for both Rebel and Imperial players. Born into the proud warrior culture of Mandalore, Sabine Wren carries the history of her people within the very armor she wears into battle. This history fuels her desire to see Mandalore freed from Imperial rule and returned to its former glory. As she joins the cause of the Rebellion, she can make use of her skills as a warrior and an artist to fight back against the Empire and inspire hope in all those suffering under Imperial oppression. Similar to the Mandalorian armor worn by Boba Fett, Sabine Wren’s armor offers her several advantages in the battles of Star Wars: Legion. In addition to providing her with a measure of protection rarely seen in Rebel units, the armor’s equipped jet pack also makes Sabine highly mobile, allowing her to quickly cross the battlefield no matter what obstacles stand in her way. Once there, she can assail her foes with dual Westar-35 Blaster Pistols or turn to more devious methods to clear a path for Rebel troops. Within the Sabine Wren Operative Expansion, you’ll find one finely detailed, easily assembled Sabine Wren miniature wading into battle—with additional customization options to match her mechanical abilities. You may outfit Sabine to dual wield her Westar-35 Blaster Pistols, or you may swap one pistol out for the legendary Darksaber. 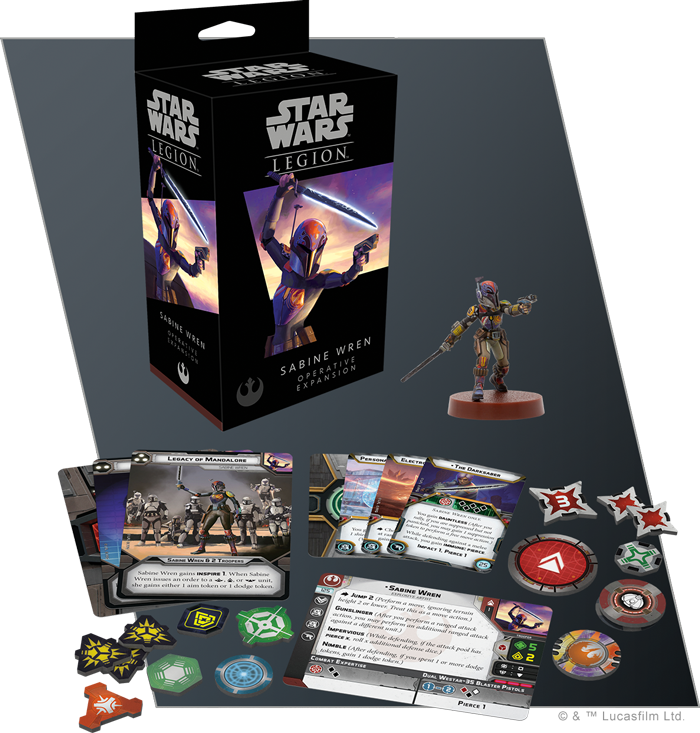 You can even choose to build Sabine wearing her helmet or with her face uncovered. No matter how you build this miniature, it offers a blank canvas for you to recreate Sabine's own artwork covering her armor or create your own. This Operative Expansion also comes with three command cards that help you unlock her full potential, alongside a unit card fully outlining her abilities, four upgrade cards to further customize Sabine Wren to fit your battle plans, and all the tokens you need to fully integrate her into your Rebel army. We’ll take a full look at everything inside the Sabine Wren Operative Expansion, including all of her upgrade cards, in a future preview!